There I was at the Lone Star Vintage Bicycle Swap Meet in Garland, TX just minding my own business when I see my daughter bringing an old friend of mine over to my table. 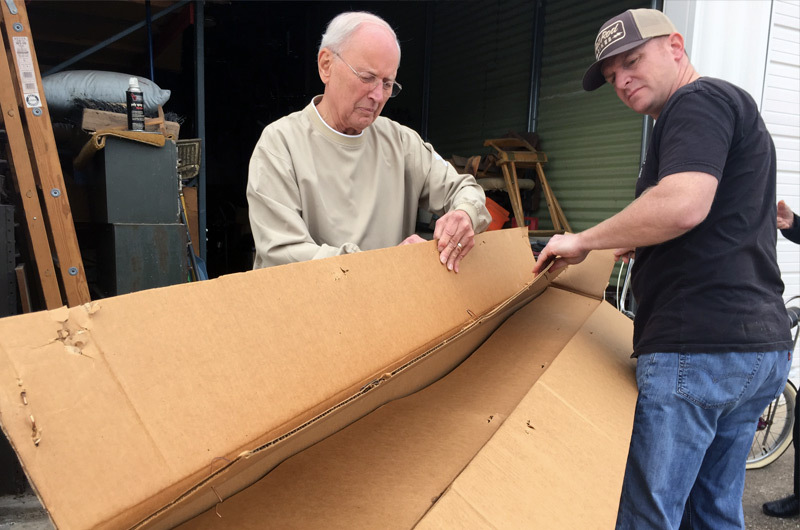 Ron Minth was in the bicycle business from the 70s through the 2000s and was one of the very first shops in the North Texas area to carry BMX bikes in the early 70s. 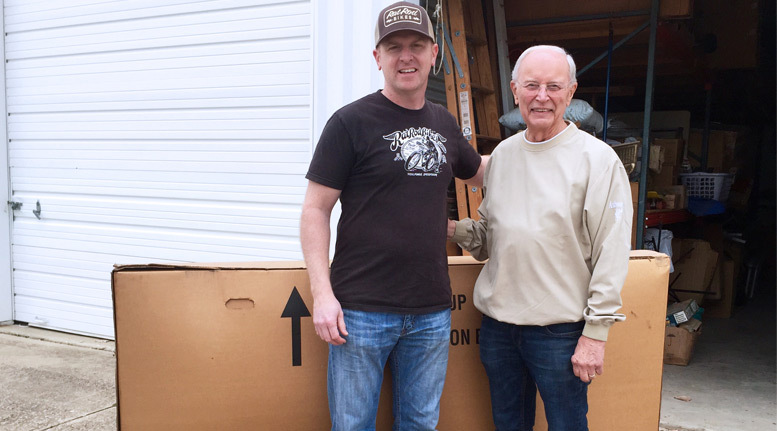 He owned a shop in Carrollton, TX called Bicycle Exchange that many collectors remember fondly. It was one of those shops with vintage bikes and parts all over the place…the kind of shop you just hardly see anymore. Ron retired about 4 years ago and sold the shop and unfortunately it only lasted a couple of more years before it went out of business. We talked for a while and got all caught up and then he mentioned that he was planning to clear out his storage building soon. He said that he still had one of the 1995 100th Anniversary Schwinn Black Phantoms new in the box up on the shelf and he planned to sell it. I remembered the bike, but didn’t remember many of the details about it. Ron shared his memories about them when they were first released. He said that the dealer cost was about $1600 each and the bikes had an MSRP of $3000. The dealers were limited on how many they could order and they produced 5000 of them. Ron was able to order eight of them and sold all but one. He recounted how he enjoyed setting them up back then and getting all of the electric accessories working. I told Ron that I was interested in the bike and over the course of a week we worked out a deal. I met up with him this past Saturday at his storage unit and picked the bike up. Before we loaded it up in my SUV I wanted to pop the box open to make sure the chrome was still in good shape. These bikes came double boxed. The outside box protected the inside box which was printed up to mimic the boxes they used in the 50s. Both boxes were HUGE because Schwinn shipped these things fully assembled with the front wheel installed. This forced these to be shipped via freight instead of through carriers like FedEx and UPS. Fortunately, it did fit in the back of my vehicle. 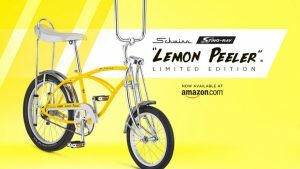 I decided to do a little more research on these bikes and found out some interesting stuff. 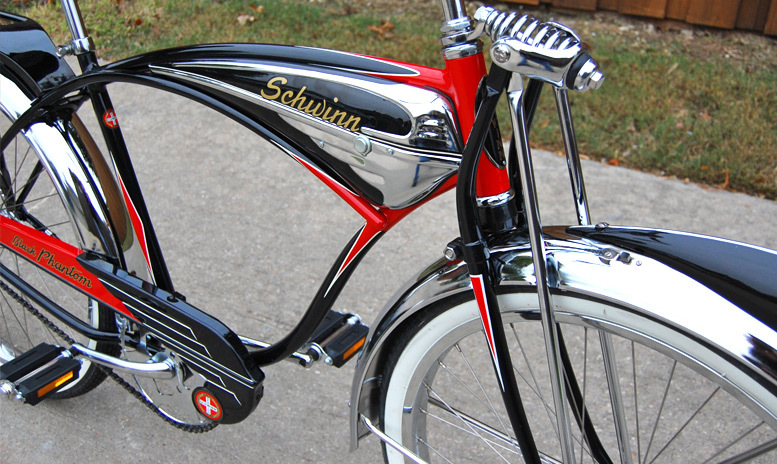 Schwinn went bankrupt in 1992 and the company was sold to Scott Sports Group in Boulder, CO. 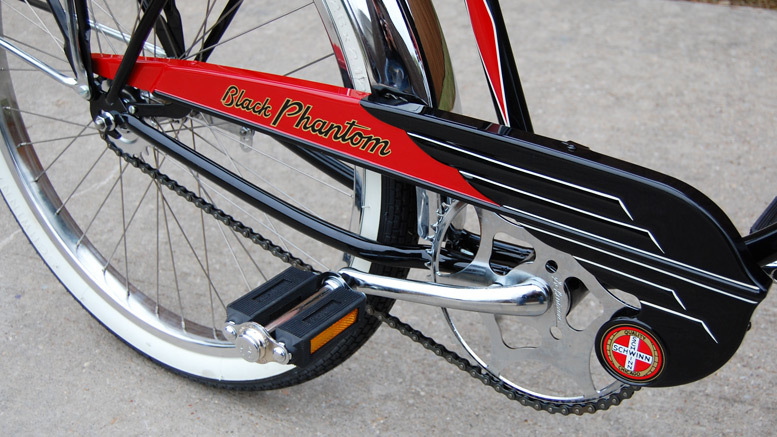 In 1995 they decided to create a reproduction of the Schwinn Black Phantom to celebrate the 100th Anniversary of the company. The company AeroCycle Inc. was contracted to build these bikes in Ontario, California. 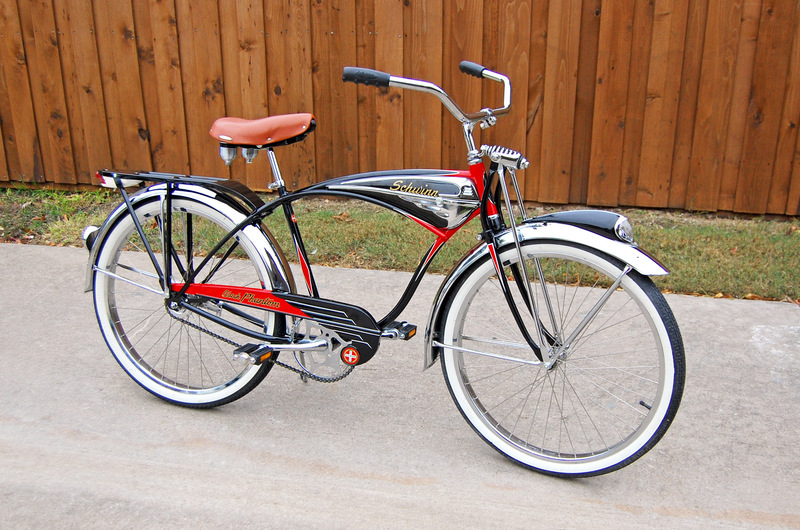 At the time, Schwinn was only making two bikes still in the U.S….the Homegrown MTB and the Black Phantom. They went through quite a grueling process to reproduce the parts. Without most of the original tooling around they had to make wax molds to recreate the parts. The result was pretty outstanding and they stayed as true to the original design as possible. They even used original style fasteners on everything instead of modern hardware. The wheels were made in the Hungarian factory that Schwinn had purchased several years earlier. 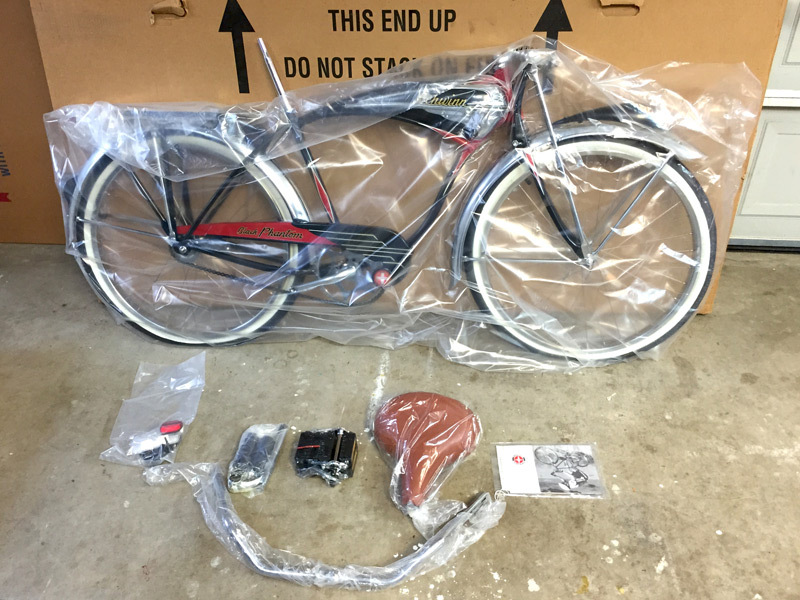 I struggled with whether I should take the bike out of the box or not. We all know that stuff like this is always worth more if you just leave it alone. I thought about it for a couple of days and decided that since I couldn’t ship it in the original boxes anyway, if I did decide to sell it, I’d have to take it out. I also just couldn’t resist being able to put this beautiful bike together and take it for a spin. 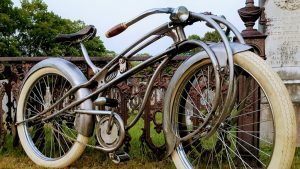 There are a lot of great details to this bike like the leather saddle, the locking springer fork, the working brake light and the horn tank. There was just so much more style in bike design from this era. I always loved how the designers tried to mimic airplanes, trains, motorcycles and spaceships. It’s definitely one of the best reproductions that I have seen. The original paint stencils were used and the pinstripes were hand painted. The bike came with two sets of pedal blocks…with or without reflectors. There was also supposed to be a certificate that comes with each bike, but I did not find that in the box that I had. I wondered if maybe they sent them to the dealers in separate packaging and they just got misplaced over the years. I know there are the Schwinn purists out there that will bad mouth this bike being a reproduction, but you have to give the company credit for doing a pretty outstanding job on this one. I was able to take the bike for a quick spin around the block and it definitely made me smile. You can just imagine how some kid felt back in 1955 coming downstairs on Christmas morning finding one of these parked next to the Christmas tree. Now the big problem that I face is….do I sell it or do I keep it?….hmmmmmm. Hott bike; awesome and informative write-up! Very nice! Thanks for posting about it. 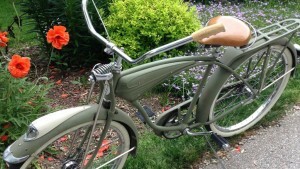 That bike was made well, just like the Giant Bicycle reproductions of the Schwinn Stingray. I would even argue that Giant did a better job on the frames and the forks were double strong, plus wider. The bikes built in the nineties and early 2000’s were very good in my opinion. My dentist has one those Black Phantom reproductions. He was anxious to show it to me one day I was there at his office where he keeps his bikes. The Black Phantom repop sure looks fine to me.